Characterized by the flavor of bergamot orange, Earl Grey has a long history dating back to the 19th century and is still one of the most widely enjoyed black tea blends. From May 15 to June 30, 2017, Café 103 pays tribute to this time-honored favorite with a masterfully crafted Earl Grey Chocolate Afternoon Tea, offering an irresistible tannic-sweet rivalry for the palate. Hazelnut Financier with Earl Grey Cremeux never fails to impress – a sweet and moist hazelnut financier is plated on a buttery chocolate sable Breton. The marshmallow-soft Earl Grey cremeux on top graces the dessert with a refreshing scent of tea while toning down the overall sweetness. A rich layer of Earl Grey ganache sandwiched between two slices of butter cake soaked in Earl Grey tea, a clever balance of tastes, is highlighted in Earl Grey Tea Cake with Milk Chocolate Cream. 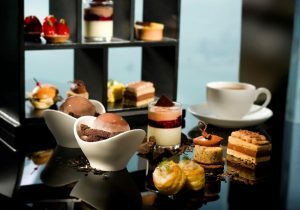 Topped with Earl Grey cream and explosive candy, the dessert surprises even the most discerning gourmets at the first bite. Strawberry Yuzu Tart is a feast for the palate as well as the eyes. Fresh strawberry and pistachio bites are beautifully arranged on light and airy vanilla Chantilly cream. The intense flavor of yuzu curd underneath enlivens the taste buds and freshens up the palate for the next sweet treat. Exclusively available at Café 103 during this limited promotion period, Chocolate Earl Grey ice cream from Tea WG, carrying rich notes of black tea, bergamot and chocolate, is the perfect wrap-up to this elegant afternoon tea experience. Guests are recommended to enjoy an indulgent afternoon between sips of French Earl Grey tea, a fragrant variation of the great classic and delicately infused with citrus fruits and French blue cornflowers. Bookings must be made at least two weeks in advance. For reservations and enquiries, please call (852) 2263 2270 or email restaurantreservation.hk@ritzcarlton.com.